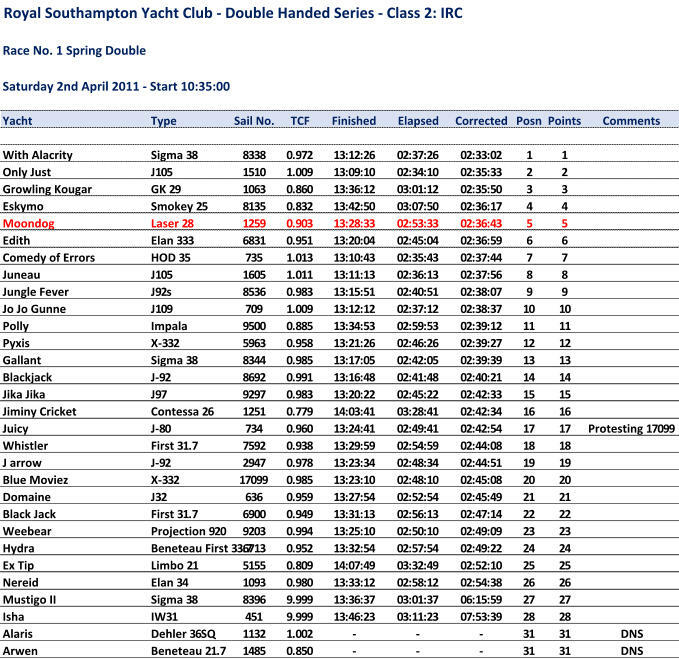 Fairly breezy first race of the season and RSYC tried to confuse the situation by splitting class two but then realising they had to start them together and sail the same course. Pretty crowded at the committee boat end of the line so we hung back to get clear and tack across the line. Fairly unexceptional beat to Quinnell and spinnaker up for the downwind leg to Hamble Yacht Services and managed to pull out some distance on Polly. Second beat back in the same direction to Williams Shipping and stayed to the South side of the Bramble Bank to keep in the stronger tide which seemed to pay off as both First 31.7's were now behind us at the mark, also put a reef in as the wind was gusting. Spinnaker back up for the run back to Fastnet Insurance and again went well down wind although a bit of a soggy spinnaker drop and pretty close to the mark with the end of the boom. One tack to the finish at Coronation and had to put the reef in as we were overpowered again. On the podium in Class 2A with a 3rd and 4th in Class 2 overall which was a distinct improvement over last year.